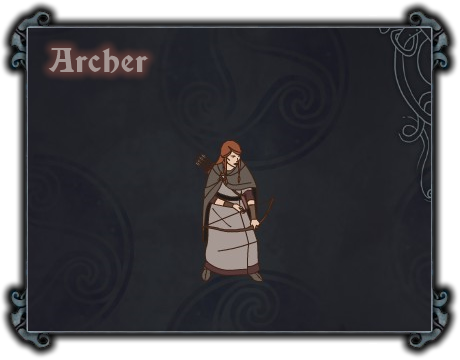 Archers may seem frail, hiding behind larger allies and wearing neither shield nor armor, yet their slim appearance is belied by their deadly accuracy. A well-placed archer can work violent marvels, sliding her arrow through rents in opponents' armor and destroying vital organs. Puncture (passive) (edit): If an Archer takes a Strength attack without moving, she gets a temporary Strength bonus for this attack equal to +1 for every 2 Armor her target has lost during the match (rounded down). Because it is a passive, Puncture damage is accounted for in the damage numbers displayed on enemies, with green numbers. Puncture is also in effect for the Bowmaster's Bird of Prey and the Skystriker's Rain of Arrows abilities, provided they do not move when using them. Example. An archer at 7-Strength firing against a 8-Armor Provoker should do 1 Strength damage, with a 90% chance. But, if that Provoker started the match with an Armor of 14, and the Archer is carefully taking her shot (without moving), her effective Strength for this attack will get a +3 boost [=(14-8)/2]. In this example, the Strength damage dealt to the Provoker is 2, with a 100% chance. Now, if the Archer was at 2-Strength, then the +3 Strength bonus from Puncture would just increase the hit-probability from 40% to 70% (to deal 1 Strength damage).